Occupy Our Homes Atlanta Presents HUD Grinch of the Year Award! 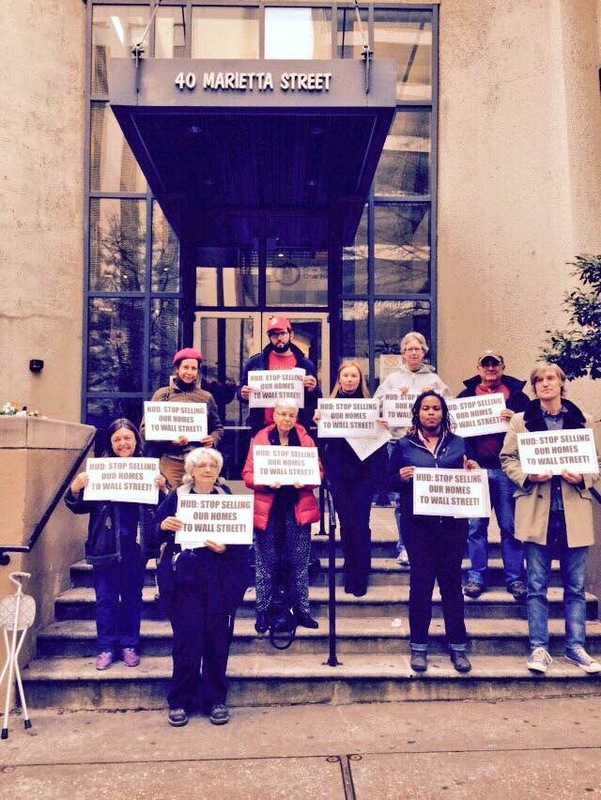 Raising rent, fueling gentrification, lining the pockets of Wall St., and all with HUD's help? This is what is happening in Georgia an across the country, through HUD's Distressed asset stabilization program or DASP. 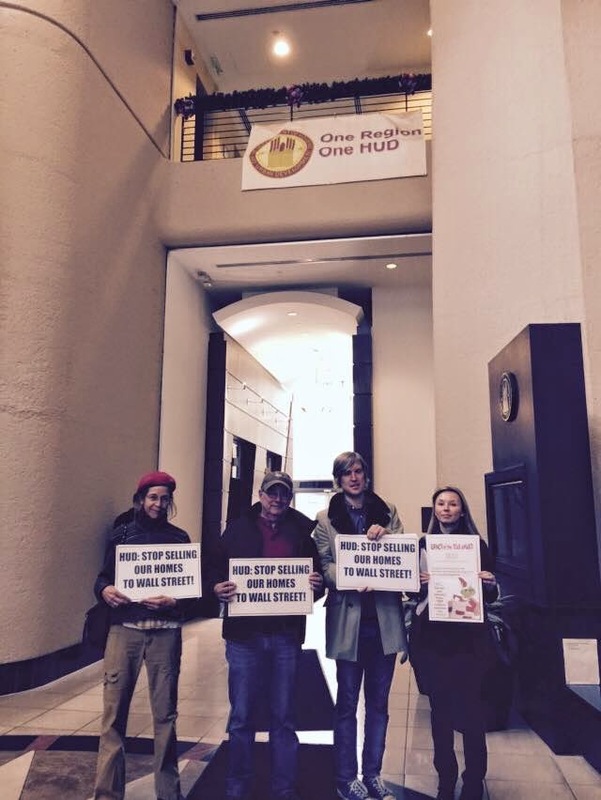 Yesterday Occupy Our Homes Atlanta and AFSC participated in a national day of action to take demand HUD reform their program and protect our neighborhoods. HUD, a government agency tasked with investing and developing our neighborhoods, are doing neither every day they fail to reform their DASP program. Tasked with selling off the "distressed assets" code for the foreclosed homes of our friends, families, and neighbors, HUD is selling these properties for pennies on the dollars, by the thousands, to Wall St and big investors who don't care about our neighborhoods. After accepting a meeting with housing groups from across the country, and presenting HUD with our plan for reform they have failed to respond in a comprehensive and meaningful way by our deadline of Dec. 15th. The stage is set for change and now we must demand that is happen. 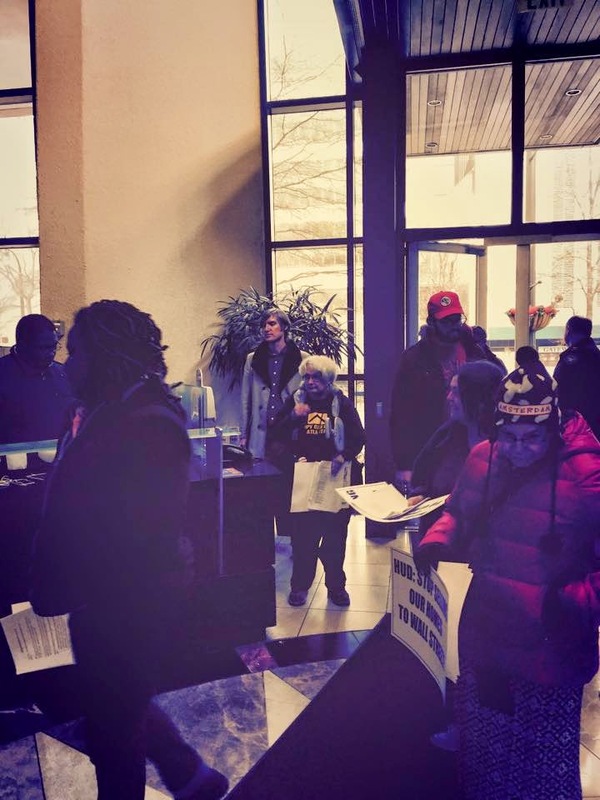 Yesterday a delegation went to Atlanta’s HUD office and delivered a petition with almost 5k signers all asking for reforms to HUD’s DASP program that would see an end to Wall Streets unbridled access to our communities. 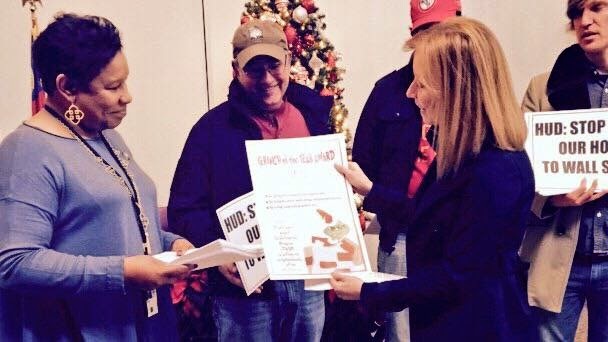 After accepting the petition HUD was presented with the prestigious “Grinch OF The Year” award for selling our homes to the some vulture capitalists that created the crisis. It's time for HUD to invest in our neighborhoods, not in Wall St. and big investment corporations who only want to invest in their own profit margin. 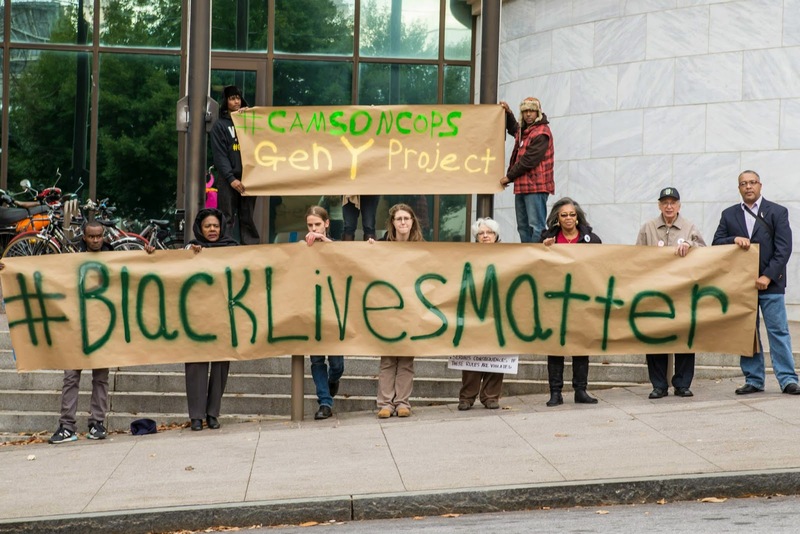 Yesterday the Gen Y Project organized a rally before the Atlanta City Council public safety meeting. 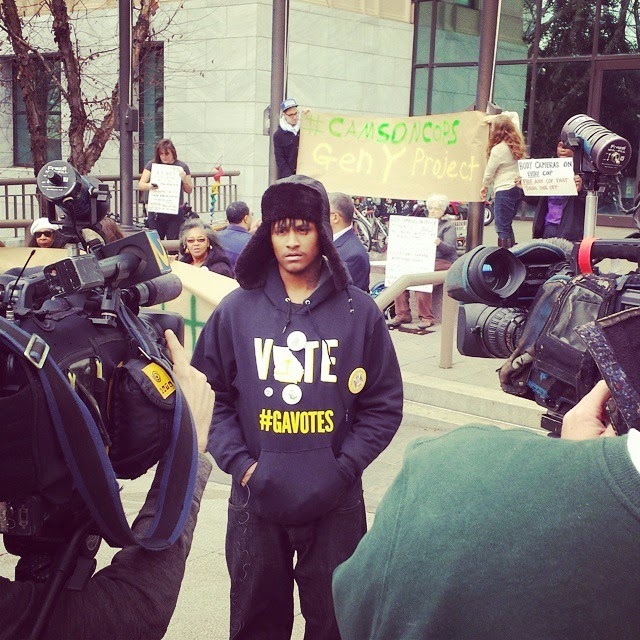 Originally the council had decided to put off having the body camera discussion till January but after getting word that youth organizers planned on being at the meeting members of the council made sure that the chief of police was there to present findings on body camera field research and public comment was opened up on the issue immediately following discussion. 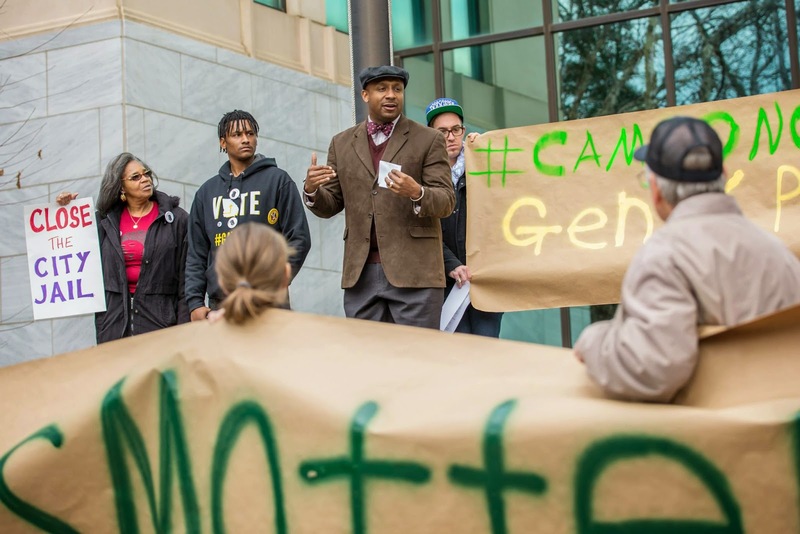 Around 15 people addressed city council about the importance of police accountability. Kathryn Johnston, Ariston Waiters, Oscar Grant, Eric Garner, Tamir Rice, Mike Brown, sadly the list of black and brown bodies brutalized and killed by law enforcement goes on and on. We believe that the mandate requiring law enforcement to wear body cameras is one small step toward keeping police accountable to the people in Atlanta. As young people who have watched our brothers and sisters brutalized and killed all over the country by those that are supposed to protect us we no longer feel safe in the community, we no longer feel like our lives matter. 1. With reports of police misconduct and brutality increasing across the nation, body-worn cameras for officers is a way to regain the public’s trust and restore order to our failing justice system. 2. Officers who are policing ethically can appreciate body cams as a resource to support their actions and responses. 3. As one example the police department in Rialto, Calif., put cameras on a group of officers and saw the number of citizen complaints filed drop by 88 percent — and more importantly, use of force declined by 59 percent. 4. Mike Brown, Sean Bell, Oscar Grant, Jonathan Ferrell and John Crawford are not alive to tell their accounts of the incidents that claimed their lives. Protecting black and brown lives should matter and this is why we support body cams. 5. Body cams eliminate he say/ she say by capturing both the officer and respondent's behavior in real time. 6. In 2015, we will not be silenced and intimidated, nor will we continue to allow the burden of proof to be rely solely on an officer’s testimony. 7. Body cams are a proven approach that promotes transparency and accountability among police officers and the communities they serve. While a vote wasn't taken Gen Y Project did succeed in forcing a conversation that wasn't scheduled until next year. It's clear that details still need to be worked out but Gen Y's voice and talking points seemed to have a clear impact on the process. After leaving the city council meeting the group chanted, "Black lives matter" and "I can't breathe". 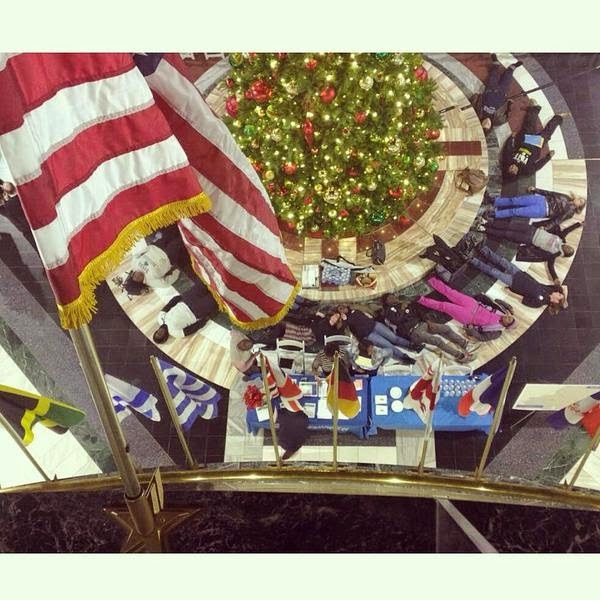 As they came to a giant Christmas tree in the lobby of city hall they held a four minute die in. 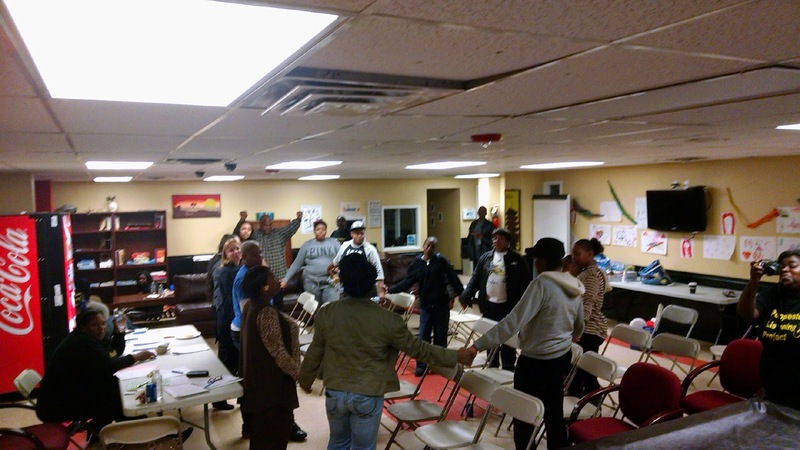 Peoplestown Tenants Pave Road to Victory! 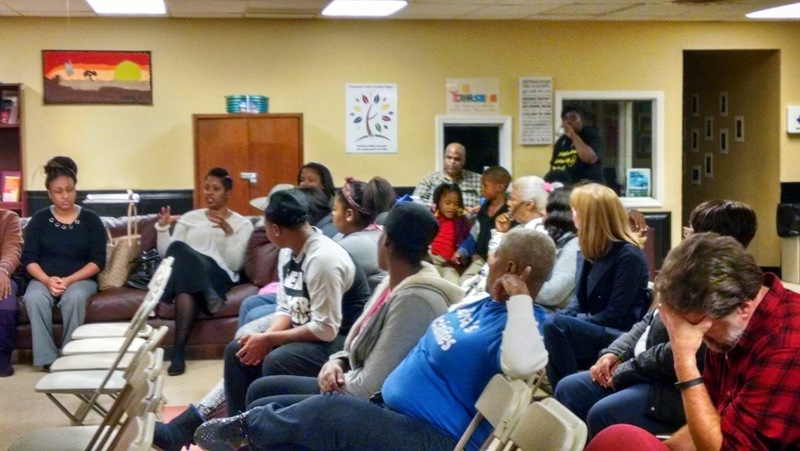 Last week Occupy Our Homes Atlanta launched an online campaign alongside the Peoplestown Listening Project and residents of Boynton Village after a series of meetings with residents of the longtime Peoplestown apartment complex. As residents did the hard work of building support in the community, launching an online petition, doing media trainings, agreeing as a group on demands and points of unity, there was an effort to reach out to the property owners(the Woda group) for a meeting. Last night that meeting happened. A copy of the petition was hand delivered to the Woda group and the property management company. 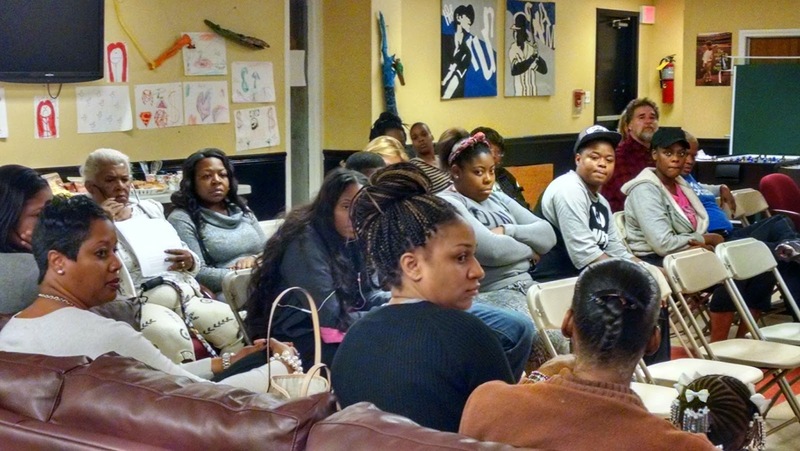 Residents had space to share their concerns and articulate their demands. Besides having serious concerns about maintenance issues, residents are concerned about their right to return after renovations are made to the property. Boynton Village was acquired by the Woda group as obvious shifts were occurring in the Peoplestown community. As the Beltline project in rolling through and Turner Field is being sold many fear that gentrification could destroy the historic community. Many of the Boynton Village residents have lived in Peoplestown their whole life and while they’ve all agreed to move out for three months while the complex is renovated, many fear they will not be allowed to return. We are very pleased with the tone of the meeting and the willingness the Woda group displayed at the meeting, we know this is a direct result of a strong turnout by residents, community members, and allies. We know it’s also a result of good organizing and points of unity agreed upon by residents. The Woda group pretty much agreed to all the residents’ demands, which is amazing! It’s important to be clear that we are not celebrating yet. The Woda group has agreed to put everything in writing by December 15th, so we await that date to confirm. A win for Boynton Village isn't the finish line for housing justice work in Peoplestown, in fact it's only the beginning. Atlanta's gentrifying forces have shifted an eye toward Peoplestown, affordable housing is already becoming hard to find. We are grateful to the 800 people who signed the online petition! Keep the signatures coming, they do have an impact when met with on the ground organizing! We are excited to continue to work with the brave residents of Boynton Village as we see the beginnings of a strong Boynton Village Tenants Associating in the works to monitor repairs, relocation, renovation, and the return to the property for all.